Electronic alternative to ion-exchange water softeners that will prevent mineral deposits and remove existing scale. 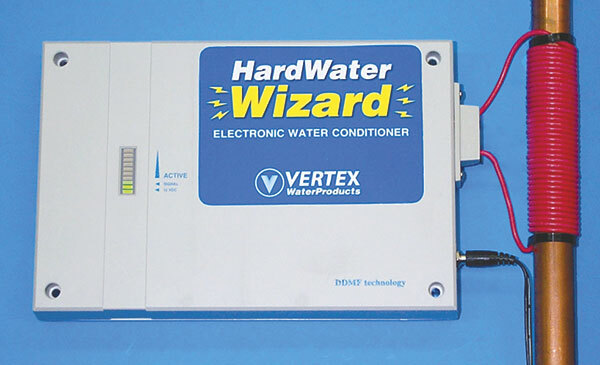 The VERTEX HardWaterWizard is an electronic alternative to ion-exchange water softeners that will prevent mineral deposits and remove existing scale. When installed on the inlet water pipe, its continuously oscillating electric field changes the property of the hardness minerals so they stay in solution and don’t deposit on faucets and pipes. 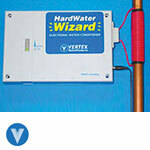 It’s a great way to condition water up to 125 grains and will work on plastic, copper and steel pipes while using less than 10-watts of electricity. Easy to install, it is an excellent choice for homeowners who want to keep scale off but don’t want the salt contamination or the maintenance and expense of ion exchange softeners. Great for use in municipalities where ion-exchange water softeners are banned. Signal “on” light and cycling LED meter.